There has been pressure for some time to cut the pay that some Shropshire Councillors receive. Now at last, we have recommendations that take out the excesses but provides enough income for councillors like me who don’t have a stack of cash in the bank. That won’t, of course, stop some people thinking we are paid too much. The plans will reduce the overall bill for councillors’ allowances by £37,400. Pay for councillors is called an “allowance”. I don’t think that is helpful. 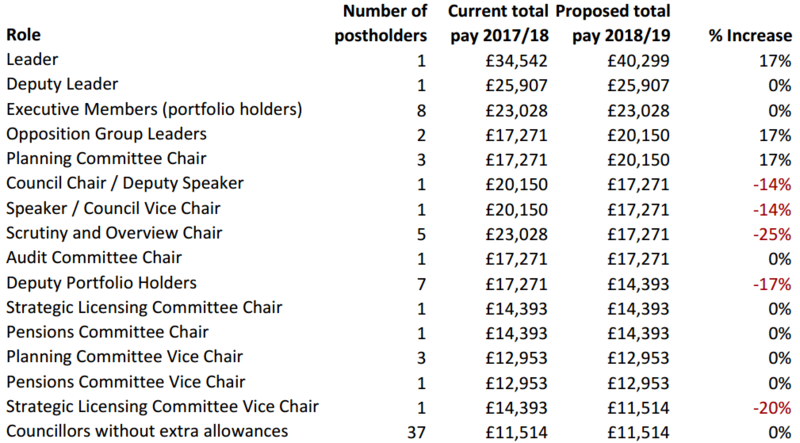 The money councillors receive is paid as PAYE. We fork out for tax and National Insurance on our allowance in the same way that everyone else does – though we don’t get pensions. So, it is pay in all but name. Councillors like me get £11,514 a year. The Independent Remuneration Panel, which has just reported to Shropshire Council, says that should not change. Here in Shropshire, we are paid above the median for county and unitary councillors across England. Being a councillor is all but a full time job for me, especially in a small town like this where it is not possible to go outside my flat without someone raising one matter or another. I am not complaining one bit! That’s what I was elected for. I certainly don’t do the work for the money but I could not work so hard on council business without the £11.5K income. For while, the main contention has not been the basic councillor allowance but the additional payments given to councillors that take on extra responsibilities – Special Responsibility Allowances (SRAs). Nearly half the 74 councillors get a special responsibility allowance (36 in all). Opposition councillors have been arguing for years that the extra allowance paid to the chairs of scrutiny committees in particular is too large. They are currently being paid the same as cabinet members without the same workload. An Independent Remuneration Panel, formed of non-councillors, has now recommended that the SRAs paid to the chairs of the five scrutiny and overview committees are cut by a quarter. I welcome that. The eight executive members are the portfolio holders that make up the cabinet, along with the Leader and Deputy Leader (who also holds a portfolio). The eight will keep the same allowances but their deputies will see their SRA cut. The chair of the council and the speaker will also get a reduction. Along with the cuts, there will be increases. The chairs of planning committees will get an overall rise of 17%. The council leader will also get an increase of 17%, more than £5,000 extra. A payment of £40,299 doesn’t seem unreasonable for a more than fulltime job leading a council with a turnover of £582 million. But the 17% rise will be looked on with dismay by many council workers who had a 5.4% pay cut imposed on them in 2011 and have since had below inflation pay rises. I don’t think I can support such a large rise when the council is still cutting back services. The changes will bring the overall pay bill for councillors in the next financial year to £1,108,223, £37,421 lower than the current bill. The new rates are expected to be agreed by councillors on Thursday 22 February.
. On top of this, councillors can claim travel expenses and, if needed, a carers allowance.
. Most appointments that attract special responsibility allowances are made by the Council Leader (many are voted into position by councillors but this is a rubber stamp of the leader’s wishes). They are therefore nearly all Conservatives. The exception to this is the Central Planning Committee, where a Labour member is chair and a Lib Dem vice chair. The Pensions has non-council members. There are 48 Conservatives on the council; 12 Lib Dems; 7 Labour; 1 Green and 5 Independents.
. Councillors took a similar cut in their allowances in 2011.
thank you for this helpful insight into the allowance/payment system for councillors. As you say the allowance for people without any extra for special duties is modest. However, the percentage increase for leader and others seems a monstrous p.r mistake given, again as you say, the restriction on the salaries to officers; smacks of all the differences between CEs and their staff in the field of banking and similar. I do understand your financial situation, Andy (join the club) but these increases for some Cllrs, against those for staff ad the slide into no meaningful services, a la all Con anti-pleb attitudes, will soon reap the understandable outcome already experienced elsewhere for the same reason. As but one example, we have family and friends in Brasil. Over the last 4 years the death rate there from casual murders has surpassed the total throughout the war in Syria. The reason? The government doing nothing to deal with speedily increasing poverty. This inspite of it being illegal to own a gun in Basil, unlike the USA, … but like (please note) the UK. It is time that the Cons understood that DESPERATION leads to desperate measures to ensure the survival of you and yours. And more and more Brits have hab enough of “doing as we are told by the Cons”.